I’ve had a rough couple of weeks. The thing is that comic book creators have given me some lessons that help me cope with rough times like this. A professional might take issue (no pun intended) with some of these lessons, but they’re what gets me to the next stage of dealing with rough patches. 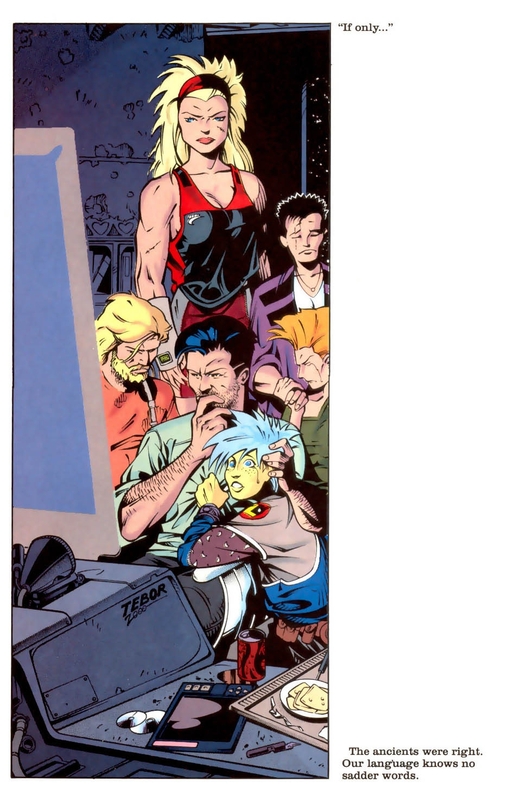 Legion of Super-Heroes is one of those titles that has always been something that I come back to over and over. One run that I really enjoy is referred to as the Five Years Late Legion, specifically the first 38 issues, shaped primarily by Keith Giffen and Tom and Mary Bierbaum. It was extremely dark in that the Earth had been covertly conquered by the Dominators. The Legion had disbanded, In almost every issue, there was some level of death and destruction. It’sonly fitting that this story should end with the destruction of Earth, even after it had been liberated with the help of two Legions. Devlin O’Ryan, the Legion member that is a journalist for the Interstellar Press is writing the account of tragic events that have apparently just occurred. Earth has emerged from a five-year occupation that were marked by fear, hatred and destruction. The Moon was destroyed just as a rebellion started that marked one of history’s bloodiest wars. However, despite all of the destruction, humanity was rebuilding. Then the first sinkhole struck Tokyo. A United Planets team led by two Brainiac 5s discovered that when the ancient underground tunnels the Dominators used were blown up, they triggered a reaction in the toxic proto jelly that had been buried in the 24th century. The reaction was destroying the Earth around it and sinking down towards the core. The Earth was going to die, so evacuations were immediately ordered. Unfortunately there was not enough time to evacuate everyone. However, there was a way to save part of the Earth. In the 28th century, retractable domes were built around key cities in case they needed to leave the planet. The domes were raised over the cities and the ancient engines launched them into space. Once away from the Earth, the cities linked up. a few cities didn’t survive the entire process. In order to protect the linked cities, now called “New Earth,” they are temporarily moved into the buffer zone between our dimension and Bgtzl. All evacuation efforts are halted as Earth enters its last stages of geologic upheaval. Two billion people are left behind to die. Amazingly, there is very little panic as the last people on the doomed planet await the end. In an instant, Earth explodes and is gone. The tragedy is compounded that it was avoidable if a desperate Earth hadn’t given in to the Dominion, or if the Earth of the 24th century had found a way to responsibly deal with their toxic waste, or live more in harmony with the planet. O’Ryan postulates that “if only” are the saddest words in the language. In the end, he reminisces on seeing the sun rise over his ancestral hills in Ireland, and now laments that moments like that are forever gone. This is such a heartbreaking story. In the Legion’s history, there are instances of at least two times the Legion helped evacuate a world before its destruction. However, its made clear that the evacuation of Earth has to be done extremely quickly and is on a scale never before attempted. If anyone came away wanting to see how the Legions helped in the evacuation, the next issue handles this, with heartbreaking effect. I don’t think that I could have handled seeing both in one issue. 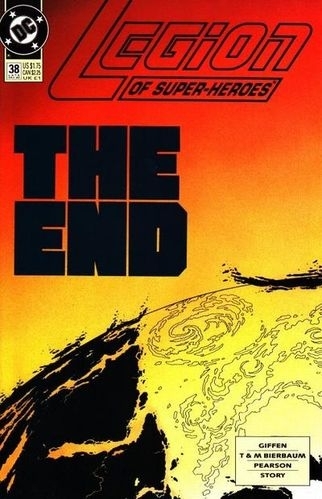 The layout of the book, conceived of by Keith Giffen (source), lends itself to telling a momentous story like the destruction of Earth. Previously, it had been tried in the sixth issue, but only in a few pages. Here, it is the entire book, save for the moment Earth explodes, which is a double page spread. The text doesn’t run top to bottom on every page, and in some pages, there is barely any text at all, left to breathe, and give the reader time to emotionally digest that this is a fight that simply cannot be won. Jason Pearson handles the art chores exceptionally well. He shows that he’s able to capture moment of starships leaving Earth and domed cities linking up in space. He also opens with an amazing shot of Devlin O’Ryan sitting at his desk. 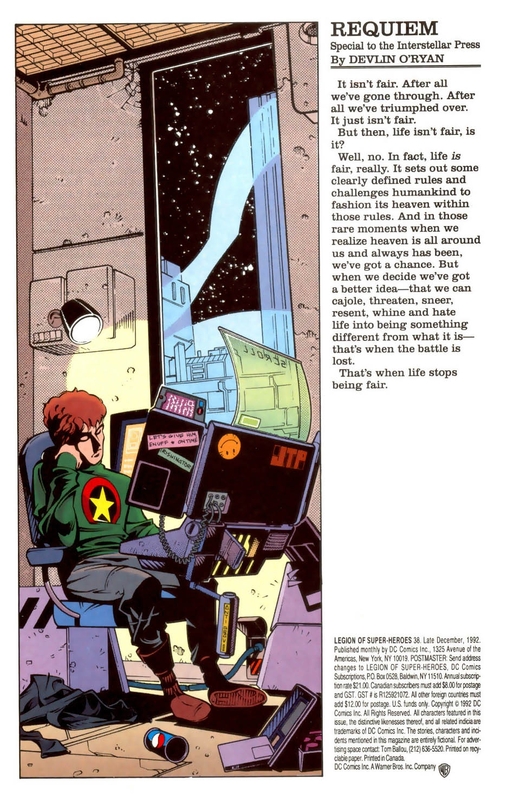 Only after the issue is over can we notice that he is on New Earth, a domed city visible through his window. His work here is amazing. I mentioned at the beginning that I’ve had a rough few days. The story opens with an explanation of the argument that life isn’t fair. Life is fair, and when we think that we can break the rules, then we lose and call it unfair. Then later we get the “if only” page. There truly are no sadder words, as we look back and ponder what we did wrong. That’s the aspect missing from most of the “what if” stories comics are so fond of over the years. This issue manages to address this regret in a way that only one other that I can think of managed to do. I remembered this page, this line, and in re-reading this issue found one of the gems of comics last great boom. Of course, this issue hasn’t been collected. The Five Years Later Legion stories are an era looked on without much fondness nowadays. It is available digitally on Comixology, if you want to read just this issue right away. I’m especially pleased that the five years later Legion stories are all available on Comixology. If you’re looking for a hard copy you shouldn’t have to pay too much if you can find it. It might even be available in bargain bins. However you find it, I urge you to go read this comic.